Author(s): Subramanian Saravanan, Villianur I.H. Islam, Krishnaraj Thirugnanasambantham, Durairaj Sekar. Narayana Medical College and Hospital, Nellore, India. Background: MicroRNAs (miRNAs) are non-coding RNAs known to control a broad range of biological functions such as cellular proliferation, differentiation and programmed cell death. Recent reports showed that miRNAs can act as oncogenes or tumor suppressors, thereby, playing an important role in cancer initiation and progression. Moreover, we know that Expressed sequence tags (ESTs) are random single pass sequence reads, which displays the condition/tissue specific transcripts (coding and non-coding) of an organism. Methods: In the present study, we have applied the bioinformatics approach to identify miRNA from prostate cancer using EST resource and its expressions were analyzed by quantitative reverse transcription PCR (qRT-PCR). Results: Analysis of transcriptomics resource from the LNCaP cells revealed the presence of an EST encoding hsa-miR-3654. Presence of the premature candidate of miR-3654, demonstrates its expression in LNCaP cells. We further indentified that the expression level (Fold Induction) of miR-3654 in LNCaP was higher than the normal and androgen insensitive prostate cancer cell lines (PNT1A, PC-3). 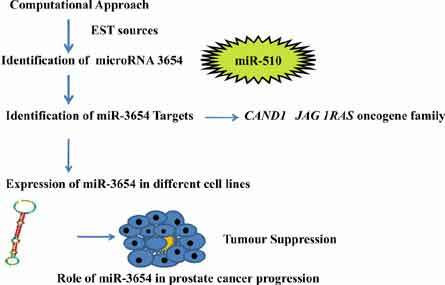 Conclusion: we have identified the miR-3654 involved in prostate cancer progression using computational approach and hypothesized that the down regulation of miR-3654 could be responsible for a solid tumor to get cancer stem-like cell phenotype. Further studies are required to investigate the molecular mechanisms behind the STAT3 mediated miR-3654 repression and the associated metastasis. Keywords: Biomarker, ESTs, LNCaP, microRNAs, prostate cancer, q-PCR. Affiliation:Narayana Medical College and Hospital, Nellore, India. Keywords:Biomarker, ESTs, LNCaP, microRNAs, prostate cancer, q-PCR. Abstract:Background: MicroRNAs (miRNAs) are non-coding RNAs known to control a broad range of biological functions such as cellular proliferation, differentiation and programmed cell death. Recent reports showed that miRNAs can act as oncogenes or tumor suppressors, thereby, playing an important role in cancer initiation and progression. Moreover, we know that Expressed sequence tags (ESTs) are random single pass sequence reads, which displays the condition/tissue specific transcripts (coding and non-coding) of an organism.